Canadian Art Border Crossings Story of a Global Nomad Venice: City of Dreams? Me(n)tal Perspectives Me(n)tal Perspectives Interlace Vie des Arts Neo Vessel O.K.A.Y. 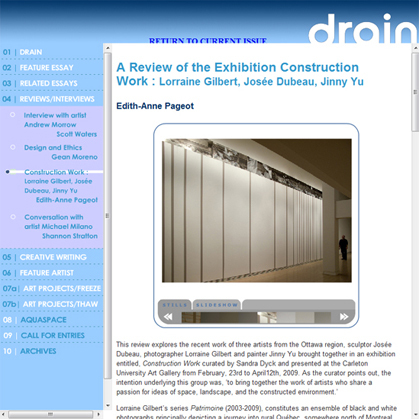 “A Review of the Exhibition Construction Work: Lorraine Gilbert, Josée Dubeau, Jinny Yu”, by Dr. Édith-Anne Pageot, Drain Magazine.